Geographic Information System (GIS) technology, associated statewide geographic data layers, and location-based system components are the cornerstone of a Next Generation 911 (NG911) system. 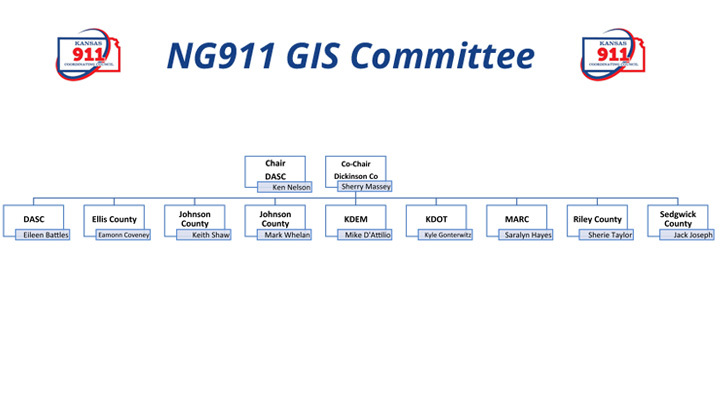 The NG911 GIS Committee is comprised of Council members and external GIS subject matter experts. Tasked with recommending GIS data standards and protocols for use by PSAPs, telecommunications carriers, and GIS service providers. Oversees RFI and RFP’s issued on behalf of the Council and recommends selection of vendors and services. Provides oversight of GIS service contracts approved by the Council and coordinates work of GIS providers with PSAPs and other NG911 system stakeholders. Coordinates state level NG911 database administration with database administrator and NG911 stakeholders. In 2011, a GIS Pilot Study was performed to determine the scope of work. The available GIS data for three contiguous counties were evaluated for quality, consistency and interagency alignment. Those counties included: Sedgwick (pop. 500k), Reno (64k) and Kingman (7k). 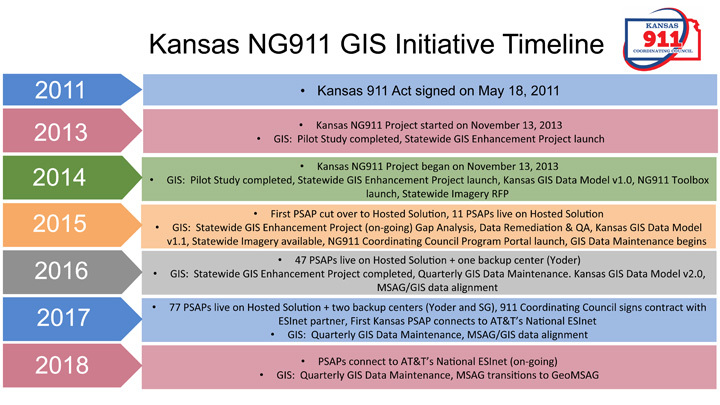 The GIS Enhancement Project was a three-phase project to get PSAP GIS data ready for NG911. An RFP was issued in Q3 2013 and awarded in Q4 2013. The QA vendor evaluated all of the submitted GIS data and reported the results along with a rough estimate on remediation costs. Coinciding with the GIS Enhancement Project, the Kansas GIS Data Model was created and statewide imagery was obtained to support the project. The Kansas 911 Coordinating Council obtained statewide, 1 foot resolution, leaf-off, natural color imagery that was flown during the winters of 2013-2015 to support the NG911 GIS Enhancement project. This imagery is now available for download and as an image service in the Kansas Data Access and Support Center (DASC) GIS data catalog. The Kansas 911 Coordinating Council, along with state agency partners, has contracted to obtain new 1 foot resolution, leaf-off, 4 band imagery to be flown starting the winter of 2017-2018. This new imagery is a licensed product and will be available by request. Check back often for updates. As part of this new acquisition, our imagery partner (Surdex) is offering a local buy up option. Please view the recorded webinar for more information. Map showing the status of Kansas PSAPs being brought onto the Hosted Solution. NG911 GIS Data Steward & GIS Data Maintainer Certification Class – 2019 dates coming soon! The Group has quarterly webinar meetings and meets in person annually at the Kansas Association of Mappers (KAM) conference.